Informing a science-based agenda for European environmental policy post 2020, Think 2030 is a sustainability platform by Institute for European Environmental Policy (IEEP) where a diverse range of stakeholders gather to discuss and propose solutions to Europe’s most pressing sustainability issues. 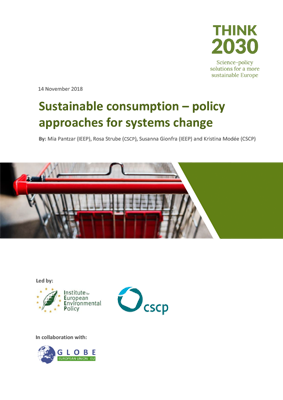 This policy paper discusses the role of the EU in driving sustainable consumption towards and beyond 2030. It identifies challenges for doing so and potential opportunities for overcoming them. Five policy themes are suggested as particularly promising to pursue for advancing systems change and deliver necessary progress toward Agenda 2030 and other internal and external commitments and goals related to sustainability. Those are the active promotion of a green fiscal reform, a centralised system for environmental product information, the provision of funding to advance the sustainable consumption agenda, the exploration of best practice and scalability of integrating behavioural insights into policies and the expansion of circular and green procurement guidelines.